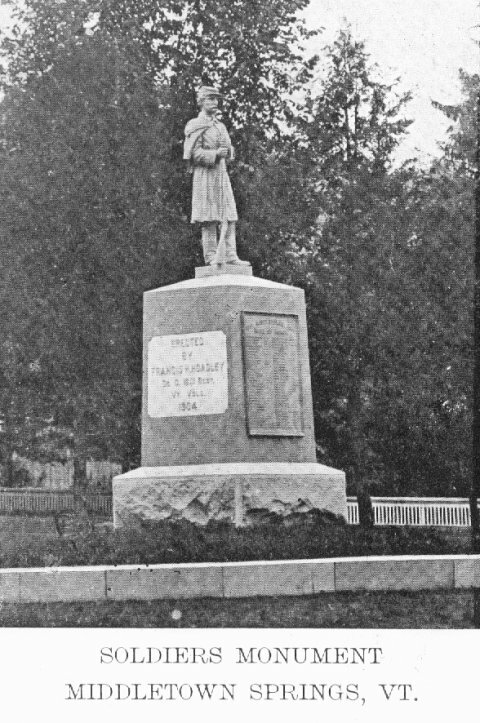 "The soldiers' monument presented to the town of Middletown by F. H. Hoadley, of Wallingford, to the memory of the soldiers who went from the town to take part in the civil war, was dedicated Memorial day by the citizens and members of the Grand Army from nearby towns." (Argus and Patriot, 6/8/1904). "Captain Hoadley was the first man to enlist from Middletown and the youngest soldier to out from that place, having been mustered in when only 15 years old." (St. Albans Messenger, 5/12/1904). Photograph contributed by John Arsenault, Middletown Springs.